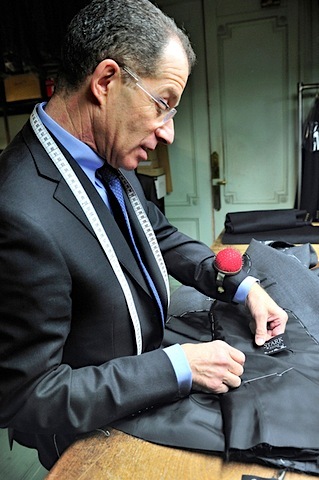 Paris tailor Stark & Sons is not on the same scale as Smalto or Cifonelli. But it is well known for producing the intricate dress coats worn by the members of L’Académie Française, also known as the immortals. The academy is the leading authority on the French language and makes recommendations on which words should be ‘admitted’ to the official dictionary. It has 40 members, who hold office for life and elect new members when old ones pass on. The black tailcoats, made of a heavy woolen cloth, are embroidered on the collar and cuffs and the edges of the chest and tails. The pattern, of olive branches to represent peace, is regulated. But members do have a little bit of freedom to express themselves. Lebanese novelist Amin Maalouf was the latest to join the immortals, and for his coat Alain Stark worked in the Lebanese symbol of the cedar tree on the buttons and the centre of the back. The embroidery takes around 600 hours of work and Alain employs a woman full time to make the three or four required each year. She was hired following a nationwide competition. Stark also occasionally makes uniforms for the prefects – heads of France’s regional prefectures – which feature embroidery on the cuffs and cap. Making for the immortals presents particular challenges, however. “Many of these men are quite old by the time they are elected,” says Alain. “So they are likely to have a stoop, or some form of irregular posture, and are often a little overweight.” Fortunately a tailcoat isn’t the hardest thing in the world to fit, without any buttoning or overlap. Alain’s position as tailor to the immortals gives him rather a standing in French society, and he tells tales about recent political events, as well as former French President Nicolas Sarkozy’s predilection for grenadine ties. Indeed, Alain has now broadened out into selling a range of accessories online, with the help of Vincent and Jacques at Mes Chaussettes Rouges. As well as a large and expanding collection of grenadine ties (14 colours at last count), the site sells braces, scarves and ostrich-skin belts. Although not cheap at €390, I had a chance to see the ostrich belts while in Paris seeing Alain, and they are beautifully soft, with a thin backing and lining in calf. Available in brown and red currently, they will soon be joined by a black version as well. Highly recommended. 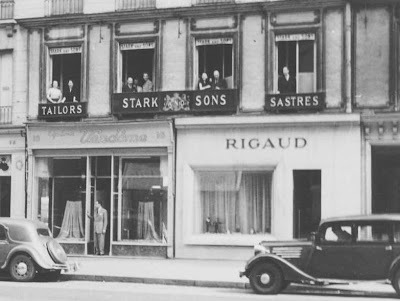 You can follow the discussion on Alain Stark, Stark & Sons by entering your email address in the box below. You will then receive an email every time a new comment is added. These will also contain a link to a page where you can stop the alerts, and remove all of your related data from the site. Interesting piece. L’Academie is one of France’s many curiosities and it’s always nice to get further insight. I do wish you would visit tailor Marc di Fiore if you’re still in Paris. Of all the Paris tailors (not a lot) he’s one you never really hear anything comprehensive on, yet the few tidbits I’ve managed to gather have been quite promising. Thanks – I didn’t this time but I plan to next. I like the pin dotted socks you were wearing on the previous post, who is the manufacturer? I also like the colour of those bespoke shoes. What is will you call that colour? This is an interesting post! I didn’t know at all this side of Stark & Sons’ business. Yet I still don’t know why this name in the first place. Do you have any idea of its history? I am a bit intringued. Alain est un homme de mérite et de talent ! Vous passerez un délicieux moment chez lui et repartirez avec de magnifiques pièces. 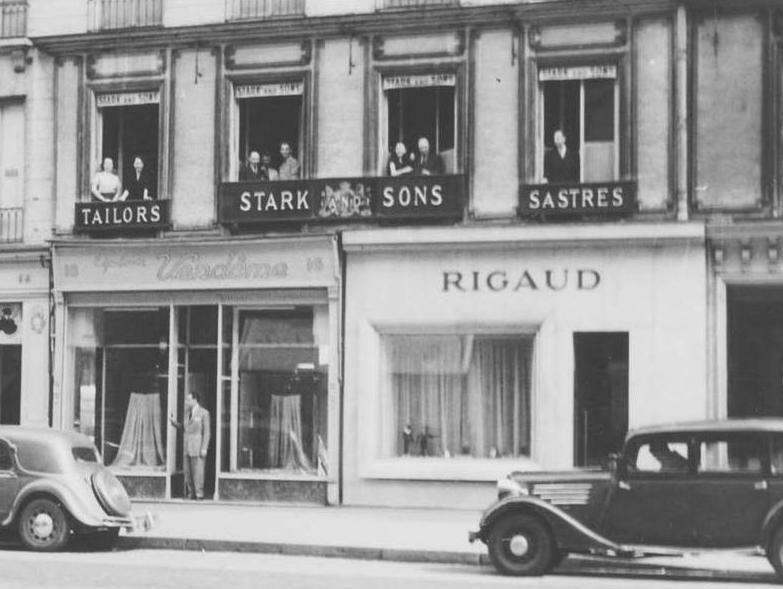 Perhaps an idea for the future – I see how Stark & Sons was purchased by Camps de Luca and then launched a semi-bespoke service. Have you considered writing about this service? Yeah, the only mention of the MTM program is a one page visit by Kirby Allison, who’s getting a suit made up presently.